Maybe you have already ended up thinking that something is missing on your feedback processes at your company, or from another hand, why do your employees claim about the feedback they receive. Have you thought that probably your company members are not actually taking advantage of the feedback they receive? Would you like to improve feedback processes? I’m here to help ? Think about a feedback moment at your company. Normally you raise a set of events that were not very positive and talk about them true? You try to understand the reasons why that specific thing failed. In this process, you usually don’t mention any positive event the person did or praise him/her. The goal here is to understand how you can give continuous feedback on daily basis and also how you can give it in a more future-oriented perspective. Here comes the feedforward concept. Feedforward is a simple way of giving feedback to employees, but instead, on focusing on past events, it focuses on the future goals and in each person strengths. With feedforward, you look to the future as the starting point. 1- Point out what was wrong with the presentation and focus on the negative aspects –> Feedback. 2- Tell him what he did the key strengths of the presentation and focus on what he can add in future presentations –> Feedforward. With this example, you understand that with feedforward you point the future goals and developments. In contrast with feedback, you point negative aspects which already happened and that you can’t do anything different about them. If you’re reading this article it’s also important for you to keep in your mind that people accept much better positive and future-oriented feedback, than negative and past-oriented one. Employees don’t want to feel judged when they fail, they want their leaders to help them so they have the confidence to improve. In an empirical approach, it was made a study, which in a universe of 22.663 observations, 1/3 of them show a decline in performance a month after the feedback session. Individuals were worse when having feedback than not having feedback at all. Feedforward increases motivation to reach the desired goals and for self-improvement – Kevin Kruse in Forbes. Individuals motivate themselves through a positive light. As an HR manager or director, you need to care about your employees satisfaction. 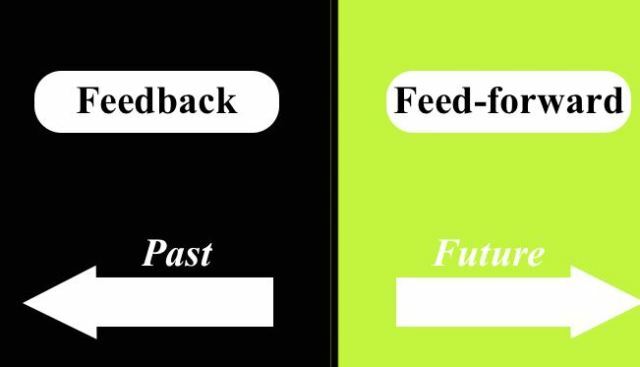 Feedforward is a supplement technique for the feedback processes and not a substitute! To know more about feedforward click HERE. With Tap My Back you can guarantee a continuous feedback culture, that at the end of the day it will enable managers and leaders to have more motivated employees and more tools for the coaching processes. To read more about continuous feedback importance click HERE.